Toby S. James: Is online registration a wolf in sheep's clothing? Is online registration a wolf in sheep's clothing? 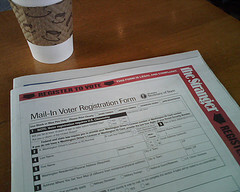 Online voter registration was in the news last week. In the US state of Washington citizens will be able to register to vote via Facebook. This will use a piece of software developed specially by Facebook and Microsoft. Meanwhile, in Britain, it was reported that Harrow has become the first local authority to allow online re-registration for those already on the electoral register. Many electoral administrators around the world may therefore be looking to online registration to solve problems with the cost of elections and low registration rates. As the Electoral Reform Society tweeted: '[b]earing in mind the UK's poor registration rates, is this the future?'. A remedy for declining registration? The development of online registration is especially important in Britain. Here, the government's legislation to introduce individual electoral registration (IER) will have its second reading in the House of Lords on Tuesday. My research on the effects of IER (a copy is also available on my website) found that we should expected IER to reduce electoral registration rates. We therefore need other ways to increase registration rates in Britain to offset this decline. The UK government has always been in favour of online registration and it published the eagerly awaited implementation plan for IER last week included. Online registration is a good thing though, yes? I've said so before. The logic is that by opening up as many methods of registering to vote as possible, registration rates will rise. Citizens are increasingly online and government services need to adapt accordingly. However, there might be a catch. Faced with budget cuts electoral administrators may use online registration as a replacement for other methods. This seems to be Harrow's thinking. They have introduced it partly as a way of saving money. Fortunately, they appear to be keeping the 'old fashioned' paper registration mechanisms too. This line of thinking informed the government's decision to not pay for campaign literature for candidates for the UK's Police and Crime Commissioner elections. Instead, of paying for one free leaflet per candidate, there would be one website on which citizens could find out about who was standing, and what for. This was quickly criticised for reinforcing digital divides and reducing electoral participation. There is also this recent research paper by Elizabeth A. Bennion (Indiana University) and David W. Nickerson (University of Notre-Dame) which suggests that online registration can make citizens less likely to register. Citizens need regular reminders, they claim, in order to re-register online. The devil is therefore in the detail. Citizen's experience of online registration therefore needs further research and its implementation in Washington, the UK and everywhere else should be carefully monitored.